M.R. James is seen by many as the master of the English ghost story. A British academic of the late nineteenth and early twentieth centuries, he wrote over thirty ghost stories, many of which have become classics frequently heard on radio or television at Christmas. 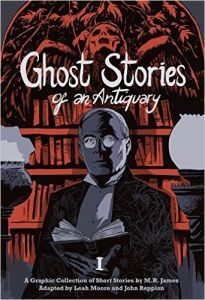 Published to coincide with the eightieth anniversary of the author’s death, ‘Ghost Stories Of An Antiquary, Volume 1’ is a graphic novel adaptation of four of the most popular tales. Given the longevity in prose form of James’ stories, the obvious question to ask is whether they gain anything from being illustrated? The four prose stories have been adapted for the new medium by the Liverpool-based husband and wife team of Leah Moore and John Reppion, who have also adapted into graphical form works by Bram Stoker, H.P. Lovecraft and Lewis Carroll. ‘Canon Alberic’s Scrap-book’ is set in 1883 and follows the adventures of an English historian called Dennistoun who visits a cathedral in the French Pyrenees to examine its treasures. When he comes across a scrapbook filled with ancient manuscripts, his initial excitement turns to horror at what he finds on one of the final pages. This is a tense story from the outset and the sense of unease ramps up relentlessly as the story progresses. Spanish artist Aneke illustrates the story with artwork that is realistic, colourful and dynamic. In ‘Lost Hearts’, we move to Lincolnshire in 1811. Twelve year-old orphan Stephen is unexpectedly adopted by his elderly cousin, an expert on pagan religions. Although his new life initially seems idyllic, Stephen soon starts to be troubled by nightmares and visions, while his adoptive guardian seems uncommonly fascinated by his youthfulness. London-based artist Kit Buss juxtaposes colour and grey tones to contrast Stephen’s normal and supernatural experiences with great effectiveness all the way up to the story’s dramatic conclusion. ‘The Mezzotint’ is different in nature from the other three stories here, as it comes across less as a ghost or horror story and more as a supernatural puzzle. When Mr. Williams, a museum curator working for the University of Cambridge, is persuaded by his favourite art dealer to buy an unseen engraving in the ‘mezzotint’ style for the university’s collection, he is hugely disappointed when it arrives in the post to find the artwork amateurish, boring and hugely over-priced. However, before sending it back, he decides to get a second opinion and is shocked to find that his colleague seems to be looking at a different picture. What is going on? Given that this story focuses on a visual artwork, it might seem to be ideal for translation into the medium of the graphic novel. Lebanese artist Fouad Mezher’s style complements the storyline perfectly, bringing the supernatural engraving to life with clarity and precision. Looking back to 1690AD and England’s equivalent of the Salem Witch Trials, ‘The Ash-Tree’ explores what happens when Sir Matthew Fell, a Suffolk landowner, has a local woman hanged for suspected witchcraft after seeing her climbing the ash-tree outside his country house in the dead of night. Although she goes to the gallows quietly, the legacy of her death afflicts his family for generations. Scottish artist Alisdair Wood brings the wildness and unpredictability of the story fully to life with his dramatic, spare illustrations. The decision to use a different artist for each story raises another question. Does the style of each adaptation’s artwork suit the story it is representing? ‘Canon Alberic’s Scrap-Book’ is portrayed with great realism and Aneke’s use of colour provides a clear contrast between the everyday world of the main storyline and the horrors revealed in and by the scrapbook. In ‘Lost Hearts’, Kit Buss adopts a semi-realistic style with a nod towards the upbeat characterisation of manga. Once again, the natural colours that are used in the ordinary parts of the story are set against a monochromatic blue-grey palette during the supernatural episodes, allied to an increasingly explicit representation of the horror elements as the story progresses to its climax. Fouad Mezher adopts a much more stylised approach in ‘The Mezzotint’, eschewing the full colour palette of the previous two stories in favour of a two-tone approach. This alternates between black and a coppery-brown sepia for the majority of the story, echoing the colouration of a mezzotint engraving and black and blue for the night sequences. Finally, Alisdair Wood adopts in ‘The Ash-Tree’ a hybrid of the previous approaches, marrying a realistic representational style of art to a muted colour palette focused largely on blues, green and browns, with shades of red generally only appearing when something supernatural is being portrayed. This provides a clear visual contrast between the ordinary world and the world of witchcraft. Looking across all four stories, I felt that the artistic style did in each case reflect the underlying subject matter, with the first and fourth stories receiving a more dynamic artistic treatment, echoing their active storylines, while the second and third stories were given more static representations which chimed with the nature of each tale. M.R. James’ ghost stories still stand up as prose some eight decades after the author’s death. However, they are full of visual imagery and thus seem like natural candidates for a graphic novel treatment. ‘Ghost Stories Of An Antiquary: Volume 1’ employs different artists to provide stylistically contrasting representations of four of James’ best-known stories. I enjoyed all four adaptations hugely and hope this volume will bring these genuinely chilling ghost stories to a whole new audience. I’m looking forward to seeing which stories they tackle in Volume 2.